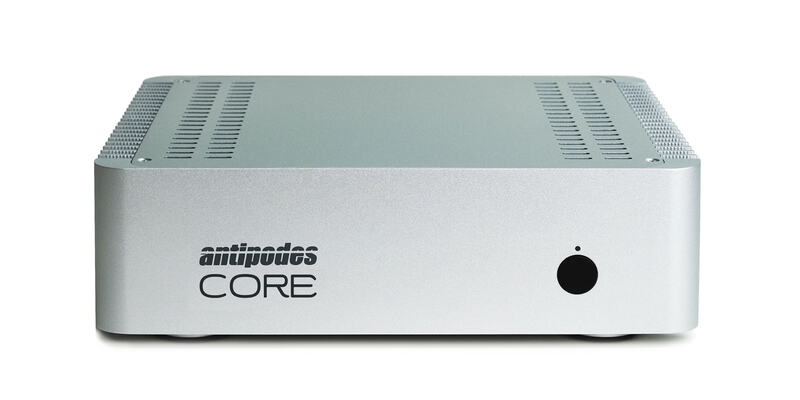 The Antipodes CORE is built around a very powerful computing engine, for demanding server apps like Roon and for fast response with very large music libraries. You can think of the CORE as a high power version of the EDGE, delivering similar sound quality, but with much higher processing power. The CORE is a high power high-end music server and renderer that will store your music and play directly to a USB DAC. You don’t need to use a separate server and renderer to get the best of both worlds – power and great sound – because the CORE delivers both. But the CORE can also be used as a powerful Server-only, such as to use the most demanding features in Roon or to organise a large music library, and play to Roon Ready DACs or to an EDGE or a DX. The low-noise design and external Level 1 ODAPS linear power supply of the CORE will lift performance dramatically over using a standard computer. See the CORE + SOLUTIONS section below for more detail. Many of our customers either have a NAS or have recently moved to digital to enjoy internet streaming services like TIDAL. So you can use the CORE without adding any storage, by streaming files from your NAS and/or the internet. If you have a large library on a NAS then having the high power reserves of the CORE will make such a solution fast and flexible. If you wish to add storage, you can add one or two 2.5″ 7mm Sata HDDs or SSDs. Just slide them in the rear slots of the CORE and organise a service call for us to log in remotely and setup your storage. The high volume computer industry supply chain can supply you storage drives at a much lower cost than the low-volume high-end audio supply chain, and you don’t have to send the CORE anywhere to fit an upgrade to your storage. The first storage setup is free. Subsequent changes to storage incur a fee for the remote service call, and this is much more convenient and lower cost for you than having to send your CORE away for a few days to one of our service centres to add storage. Pre-installed storage is also available through your dealer. Many of our customers don’t need a ripper. They may have already ripped their collection and be acquiring their music online now. Or they may have another device that can do high quality ripping. But you can simply add a USB CD/DVD drive from a computer store, and plug it into the CORE to use our auto-ripping app, which ensures the best possible rip is achieved. The ripping software reads every sector twice and only moves on when the rips are identical. If there are differences the rip speed is reduced in steps till two identical rips are achieved. In this way, the actual optical drive you use has less influence on the rip quality. We will shortly be launching ripper hardware that provides excellent ripper quality and reliability for adding to the CORE or EDGE. The Antipodes EDGE and DX have sufficient power for all of the playback options available, except for some demanding DSP features such as upsampling to DSD256 or DSD512 during playback. The CORE is designed to handle Roon’s DSD upsampling up to DSD512, and it will also enable you to navigate or search a large library with speed. But what makes the CORE different from a simply powerful computer is that the power has been achieved while keeping electronic noise very low. This enables the CORE to sound as good as our medium powered EDGE. This is partly due to our “ground-up” design approach to minimise noise, and partly due to the CORE being powered by the external Level 1 ODAPS Linear Power Supply. Achieving this level of sound quality on USB from a very powerful device is a major breakthrough. The DX, CORE & EDGE combine both Server and Renderer functions in a single device, and this dramatically reduces network noise interference with the digital audio signal. The effect is greater immediacy, dynamics and life. Typically, network noise softens the sound, but this negative impact is reduced if you use a low-noise server such as the CORE. To clarify, the CORE is silent and does not need a fan, but we mean that the CORE is designed for very low electronic noise, because electronic noise generated in a server will leak into the digital audio signal. The quality of the CORE enables you to get great sound with separates (running the Server Apps on the CORE and Renderer Apps on an EDGE, DX or other device). Using a CORE for the Server Apps removes the Server processes from the EDGE or DX, and this has a beneficial impact on sound provided the quality of the network is good, since the files are now streamed over the network. Adding a CORE to an EDGE or DX will improve sound from top to bottom, but the improvement increases as you go down the audio frequencies. The improvement in the bass region is very marked, particularly adding depth, control, detail and timbral accuracy. To get the most out of using a CORE + solution we suggest you use short and high quality Ethernet cabling and, if possible, power your Ethernet switch with a linear power supply. If you already have a CORE, you will significantly improve audio performance by adding an EDGE, or improve it even more by adding a DX. If you already own an EDGE or DX, you can improve audio performance, plus dramatically improve processor power, by adding a CORE. The low-noise performance of the CORE benefits the sound of any renderer, and also enables you to locate the CORE in your stereo system – something you would not have contemplated with a high-power computer before the CORE. This is enhanced by the fact that the CORE is completely powered by the external Level 1 ODAPS linear power supply, keeping switch-mode noise away from your system and away from the signal chain.